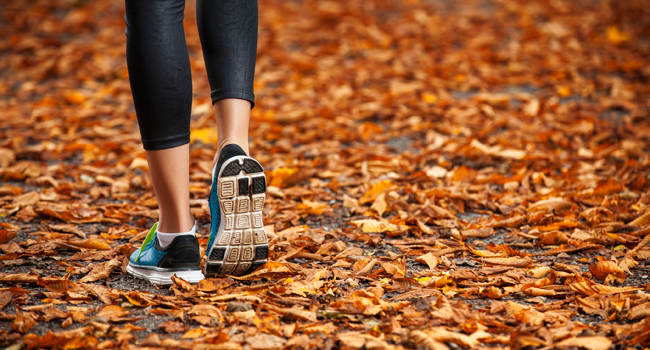 Whether you run early or late, the clocks going back can affect your regular training runs. Stay safe with our top safety tips for female runners. You may need to rethink your kit now the clocks have gone back. Bright colours and fluorescents are great for low light during the day but once it’s dark, you’re better off wearing kit with reflective panels. Go for white kit (rather than bright colours) and certainly do not head out for a run at this time of year dressed head to toe in greys or blacks. Make sure reflective bits of kit are on your arms, legs and feet (the bits of you which move). Did you know that you should always run facing incoming traffic? The only time this changes is when you’re approaching a blind corner, in which case cross over (but cross back again when it’s safe). This is even more important at this time of year when you might have to run in the dark. Motorists will still be getting used to the change in light, too. Make life easier for them by knowing the rules of the road, and take responsibility for yourself. If you feel more vulnerable running outside at this time of year, take some common-sense steps. Don’t run the same route and the same time every day. Switch things up so your routine is less predictable. Tell people where you’re going and when to expect you back. And don’t run with headphones in. When it’s dark, we lose our peripheral vision, and running actually feels more challenging. You may need some time to adjust, so stick to running routes which are well-lit and have a reasonably even surface, so your mind and body can adjust to the new sensations gradually. This time of year is a great time to consider joining a running club or group. Or find a training partner (or convince a friend to take up running). Not only is there safety in numbers, but running with others gives you extra motivation to get out there when the sofa and TV might otherwise sound pretty appealing! – Make sure your kit has reflective panel.